Luxurious high pile berber fabric. Raised border provides added comfort and support. Fits most common crate sizes. Size: * XS 15" x 20" SM 19" x 24" MED 21" x 30" LG 23" x 36" XLG 28" x 41"
Urban pet mat one piece. 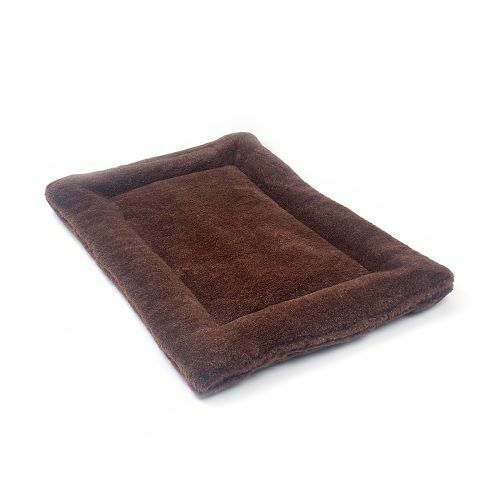 Your best pal will love this cushy and cosy sleep choice! Ideal for crates, auto travel, visiting, etc. Fabric: Fill is polyester fibre sheet, border stitched around. Washing: Pop the whole mat in to washer, cold water, mild detergent and cool dryer setting.